Multitalented musician Michael Emenau a.k.a. MNO examines the process of reharmonization and explains how it can help your next remix. I was recently asked to do a remix for a well-known “world music” artist seeking to get her music into new markets. I was also given Tomas Gold’s remix of Adele’s “Set Fire” and Rihanna’s “Only Girl In The World” as reference tracks, which let me know she wanted the remix to be clubby and have a big pop sound. Both reference tracks are uplifting and happy, so I decided to write the remix in a major key at a tempo between the 120-130 BPM range. Upon hearing the original track, I was presented with two challenges: the original track was in B minor with a tango rhythm clocking in around 145 BPM. The process of slowing the tempo was no problem. I began by slowing the vocals down to 125 BPM and then loaded the backing tracks. Often, when I have to tempo shift downwards, I prefer to start with a clean slate rather than try to squeeze or stretch the instrumental tracks to fit the new tempo. To get the remix into a major key, I changed the tonal center from the original key of B minor to the relative major key which is D major. The next step was to reharmonize the melody in the new key. The result was a success! The reharmonization fit the new style, and successfully transformed the track into a very uplifting and dance-friendly version. Let’s take a closer look at the key musical concepts and explore the tonal center, how to change the tonal center, and how to reharmonize the melody based on the new tonal center. The tonal center, in almost all cases, is the same as the key of the track. For example, if the track is in C major, then the tonal center will be C as well. When the note C is played or sung, it creates no tension. Other notes in the same scale also sound pleasant and harmonically correct, but the final resolution of the melody sounds the most pleasing when ending on C.
Changing the tonal center to the relative major was essential to create a more uplifting feel. Let’s delve into this approach further and talk about scales. Many scales are related to each other, and it’s the note that you start on that defines the scale and tonal center. Fox example, an A (natural) minor scale has the exact same notes as a C major scale. This theory is why we say that C major is the relative major of A minor. Conversely, A minor is the relative minor of C major. To find the relative major of any minor scale, just count to the third note of the scale. If you’re in F minor, the third note of the scale is G#. Voila! G# major is the relative major. To find the relative major of a minor scale, count backward two notes to the sixth note of the scale. In G major, move down two notes in the scale, and you’ll find that E minor is the relative minor. Learn more about scales in my other article Music Theory Tutorial: Scales, Scales, Scales. 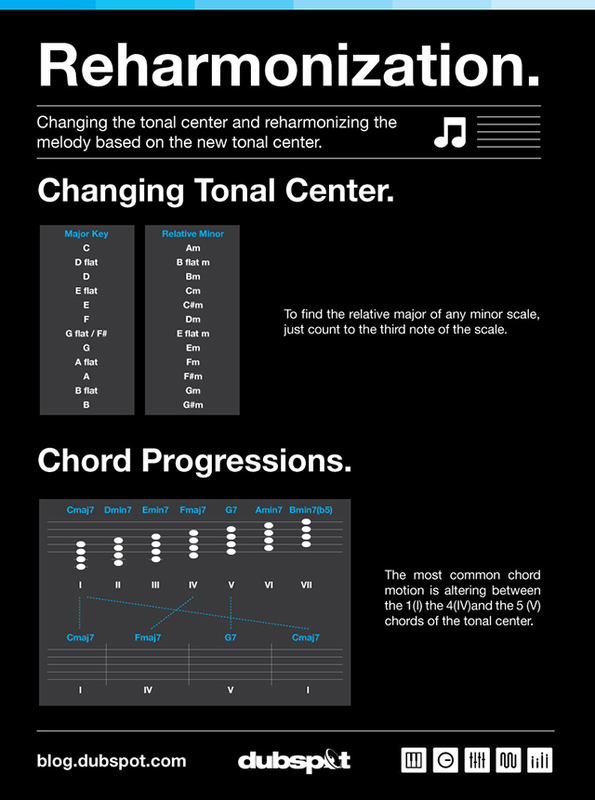 With the new tonal center established, you can start experimenting to create a new chord progression. The most common chord motion in popular music alternates between 1(I), 4(IV), and the 5(V) chords of the tonal center. For example, the key of E would be E, A, and B. This chord progression approach is also most commonly used in blues, funk, folk, and rock music. This next video explains the “Twinkle, Twinkle, Little Star” reharmonization in terms of tone center and use of the relative minor. The original song is in C major. We count down two notes from C to A and make A minor the new tonal center. The I-IV-V chords in A minor are A minor, D minor, and E maj (E7). 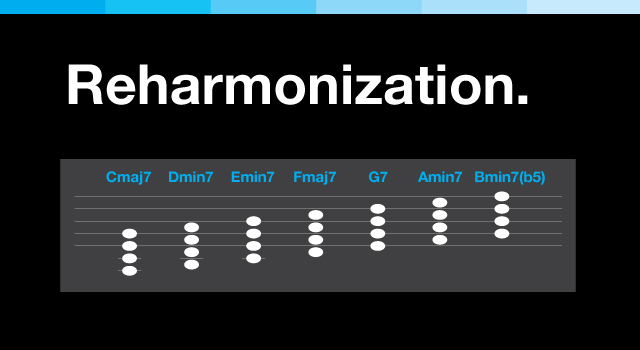 These examples are the basics of changing the tone center for reharmonization. Generally speaking, the “relative chords” work more smoothly, but there are many other options. For example, try building major progressions from the fifth note of the scale, or even from the fourth. Also, try experimenting with either major or minor chords, the results may be quite surprising. As you delve more deeply into reharmonization, you will find that sometimes a melody note conflicts with the chords. When this happens, be flexible and try to change a chord from minor to major, or even try lowering or raising the melody note a semitone. Your ears should be the final judge, not your eyes or any rules about harmony. Keep in mind that music theory is a tool for expanding your creative process – it’s up to you to make it beautiful. Michael Emenau, (MNO), has worked professionally as a classical and jazz musician, composer, producer, and remixer for over 15 years throughout North America, Asia, and Europe. He began his professional career in Canada as a classical musician. Early in his six-year spell playing in orchestras, MNO crossed over to jazz, a radical transition, which brought him to Asia. While living in Japan he honed his skills as a studio musician, playing and recording extensively in electro-jazz, dance, and other electronic-oriented music. His work can be found on over 50 CDs including playing vibraphone for the Japanese Acid jazz group “UFO” on the hugely popular “Red, Hot, and Cool” release. The impact of his time spent in Asia, (including extended time in India, Thailand, Malaysia, Vietnam, and Korea), can be heard in his compositions today. Presently Michael resides in Paris, France where he is a freelance vibraphonist, producer/remixer, and laptop musician and a member of “Anatomic Dada” featuring a quartet of 2 laptops operated by various mallet and percussion midi controllers and two video manipulators.